Mountain View Estates Calabasas is one of Southern California’s most luxurious and desired gated communities and widely considered as a model for exclusive gated living across many cities in the country. To begin with, Mountain View Estates is simply surrounded by beauty. The gated community of Calabasas sits smack dab inside the lush, federally protected Santa Monica National recreation area, which is located on the eastern edge of the San Fernando Valley, and of course belongs to the city of Calabasas, voted one of the safest cities in America. Incorporated in 1991, Calabasas offers homeowners the best of all possible worlds: affluence infused with old-fashioned country charm; stylish dining, shopping and entertainment venues; miles of open space for hiking and outdoor activities, and some of the most coveted luxury home developments in the Southern California area. Of the more than half a dozen gated communities of Calabasas, the residential homes situated inside Mountain View Estates Calabasas are among the largest. There are 385 homes in Mountain View, all built between 1990 and 1998 and offering some of the most luxurious amenities available, including backyard swimming pools, tennis courts, large pergolas with outdoor dining areas and sweeping views of the stunning Santa Monica Mountains and woodland areas. Mountain View Estates offers unparalleled access to exhilarating hiking and bike trails and is within walking distance to Gates Canyon Park and Brandon’s Village, a seven-acre outdoor playground the city of Calabasas acquired in 1993. Gates Canyon park offers large picnic areas with barbeques, a fitness course, basketball court, tennis courts, and open grass area. Brandon’s Village, the playground, was designed by Shane’s Inspiration, a non-profit organization that designs and builds universally accessible playgrounds and features equipment that is more than 70% independently playable for children with disabilities. Mountain View Estates Calabasas also is close enough to all of the city’s retail and entertainment amenities, so residents of the gated community are always just minutes away from the all of the modern conveniences of “city life and about 20 minuits from Malibu. Home prices in Mountain View Estates Calabasas start in the $2,000,000 price range, with Home Owners Association Fees at $420 a month, which is relatively low compared to other Calabasas gated communities. The gated communities of Calabasas, in particular, Mountain View Estates Calabasas, are among the most sought after areas in the Southern California region in which to live, work and play. All of the Mountain View Estates Calabasas have large yard space with significant open spaces between you and your neighbors. The average lot sizes at Mountain View are 19,334 square feet and the largest lots in the community are about 57,000 square feet. Mountain View Estates Calabasas provides one of the most unique and richly rewarding living opportunities anywhere in the country, particularly for families with children. This stunning gated community of luxury homes was designed to offer residents desiring the feel of a small-town lifestyle, a progressive yet safe place to live, work and play, complete with walkable streets, the majority of which are cul-de-sacs, which make the community a perfect choice for those with kids, as well as those who love to spend their time outdoors walking pets and strolling to visit with friends or and neighbors. Security services at Mountain View Estates Calabasas and are unsurpassed in terms of quality and efficiency. There are two security gates in the community, This helps reduce time for residents coming Calabasas gated communities and going, especially during holidays and other events. Many have only one security entrance, which is used for both entering and exiting. Security patrol cars are present consistently throughout each day and overnight and most of the security staff have been working at Mountain View Estates Calabasas for more than five years some—some for more than a decade. The Mountain View Estates Calabasas security team knows all of the residents by their names, so no one is ever made to feel they are strangers to the same individuals hired to keep their community safe—a truly small-town idea that provides one more excellent reason for choosing this Calabasas gated community. Not only are each of the security team members at Mountain View Estates Calabasas efficient and experienced, they also are extremely friendly and keep a familiar approach with residents, informing them if they’ve left a kids’ bicycle out overnight or a garage door open. In short: they care about the residents and their safety. "Striking modern traditional with an ideal location in prestigious guard gated Mountain View Estates. Extensively updated to today's taste. Interior appointments include a grand two story entry with wrought iron sweeping staircase! In addition, there are wood and stone floors, center island kitchen with stainless steel appliances and white quality cabinetry and much more. The highly desirable floor plan boasts 5 large bedrooms, 4.5 baths and a separate office. The rear grounds are amazing! Slatted wood covered patio, barbecue center, custom pool and spa with water features and manicured lawns. Other amenities include a three car garage, three fireplaces, deep custom detailed driveway and much more! Also available for lease at 17k per month. This one's a winner!" "Pure paradise awaits you behind the guarded gates of Mountain View Estates. From the curb appeal to the resort style entertainers backyard, this former model home exudes the 'wow' factor. Pass through the double door entry giving way to a grand entrance with sweeping bridal staircase and high ceiling. Elegant formal living room has coffered ceilings and cast stone fireplace. Formal dining room with cased ceilings has french doors that open to the outdoors. Family size chef's kitchen has granite counter tops, custom cabinetry, large center island, breakfast bar, walk-in pantry and casual dining area. Family room has coffered ceilings with cast iron fireplace and built-in cabinetry. The master suite is pure luxury and boasts two large walk-in closets with cast iron fireplace. Master bath has marble floors, large soaking tub, beveled glass vanity, stand alone shower stall and private water closet. All secondary bedrooms have private baths that have been updated. Outdoor living amenities include; pool, spa w/fountains, private casita, cabana, built-in BBQ with covered patio and basketball court." "Mountain View Estates gated and guarded community.Nestled up a beautiful street , this immaculate, model sharp estate offer sweeping pastoral and sunset vies. Light and bright and beautifully updated throughout. Features include a center island kitchen with viking stainless steel appliances, 5 Bedroom suite 4.5 Bathroom, including oversize master suite with dual new closets and master bathroom. Open floor plan, high celling and custom window covering. An office,Sunny living dining & family room, engineering wood floor. The spacious back yard offer pool and spa, built inn BBQ area, entertainment areas and large patio. This gorgeous home offers a great location a quiet street, a desirable floor plan, good usable lot, and stunning view." "PRICE REDUCED! Mountain View Estates most popular, expanded 6 plan boasts 6,610 feet with 6 bedroom suites, living & family rooms, formal dining & music room. This house shines with natural light. Boasting a wide open entry that looks straight through from the front door to the rear grounds. Loads of expensive custom built in cabinets & bookcases thru-out. Crown moldings, three fireplaces, plantation shutters, bamboo floors and surround sound highlight this home. With two bedroom suites down and 4 up including the over sized master suite featuring dual bathrooms, 3 walk-in closets (one is customized with built in drawers & cabinets), with fireplace and beautiful views over the mountains. The large eat in family kitchen with European cabinetry overlooks the grounds with large picture windows feature a premium flat 15,250 foot lot with pool & spa with water slide, BBQ center and large grassy yard all with beautiful views." "Welcome to Mountain View Estates located in a gate guarded enclave high above Calabasas. This redone estate will knock your socks off! You're greeted by stunning oak flooring & jetliner views that go on for miles and it has a clean, open feel with minimalist aesthetics.Its large rooms and windows open to an expansive totally private yard with 280-degree views on a hard to find lot & cul-de-sac-location.All the bathrooms have been remodeled with gleaming Walker Zanger counters, high end vanities and fixtures. The spa inspired master bath boasts a soaking tub with windows and greenery as a backdrop, dual vanities, built-in cabinetry and an enormous shower with beautiful custom tile work.The master suite is complete with sitting area with one of the several redone fireplaces, a coved ceiling and views! The formal living room is stunning with its coffered ceiling & redone white mantled fireplace. Formal dining room just off the double door 2 story entry & flanked by the grand redone spiral staircase w/a crystal chandelier floating high above in a lighted, coved ceiling. The massive family room and all the bedrooms have new crown molding, base & Emtek hardware. There are lots of designer touches along with freshly painted walls that finish it off beautifully!" "This is the one you have been waiting for! Gorgeous, remodeled and updated, MOVE IN READY nestled in the hills of Calabasas rests this jewel of a home. This Mediterranean-styled masterpiece in the prestigious gated Mountain View Estates is a true California treasure. The resort style backyard offers captivating views alongside a pool(upgraded), Jacuzzi, covered patio, and guesthouse. The backyard is pieced together with ample grass area and a BBQ station perfect for entertainment. With over 5,800 sqft of living space, this 5 bed 5 bath dream home is a must see. The newly renovated grand staircase leads you to the master suite consisting of a spa-like bathroom with a whirlpool and steam room, his and hers walk-in closets, office area, workout zone and massive patio terrace with truly breathtaking sunset views. The living room possesses gorgeous hardwood floors and its elegance and exquisite attention to detail offers intricate moldings, a large cozy fireplace along with a very unique custom made ceiling. The large open living room also gives you the luxury of being able to entertain with a sit down wet bar perfect for entertaining. This elegant freshly painted kitchen has solid appliances which gives you the perfect setting to enjoy your cooking time. The living room has phenomenal acoustics which has held numerous professional concerts. Mountain View also offers tennis courts and is right down the street from Brandon's Village which offers more tennis courts and playground"
"BACK ON THE MARKET AFTER GETTING BRAND NEW FLOORS INSTALLED! Step through the Wrought Iron Doors and you will instantly see why this is not your typical Mountain View Estates home! HUNDREDS OF THOUSANDS of dollars in upgrades make this highly sought after Plan 6 home the masterpiece that it is. The stunning home features 6 bedrooms and 6 bathrooms all en suite. The master bedroom + bathroom just went through a complete upgrade which includes a Toto Washlet smart toilet, Bain Ultra smart tub with aroma therapy, a state of the art steam shower and two giant redone closets costing over $200,000. Other incredible upgrades include BRAND NEW WOOD FLOORS THROUGHOUT THE ENTIRE HOME, a full gym, saltwater pool with smart phone integration, outdoor loggia, firepit and rose garden. Award Winning LVUSD school district and 24/7 guard gated security! This home will not last! If you want the best of the best this is a must see!" "Spectacular Guard Gated Luxury Estate in Prime Calabasas Location! This stunning, completely remodeled showplace is a highly sought after Mountain View 10 . Striking curb-appeal and lush lot with huge entertainer s covered patio area, BBQ pavilion, magnificent pool and spa, as well as a Zen-like waterfall and Koi pond. Enter this magazine-quality estate and you will immediately be struck by the grand 2-story foyer with walls of luminescent light. Elegant formal living room features soaring ceilings and a dramatic fireplace. Private dedicated office with built-in bookcases. Grand family room with entertainer s bar, sumptuous fireplace and picturesque views. The elegant, professionally equipped chef s kitchen will delight all of your senses, featuring new cabinetry, quartzite countertops, back-splashes and top-of-the-line Viking appliances, as well as a, light filled adjoining casual dining area. The working butler's pantry will lead you into the sumptuous, oversized formal dining room! There are six luxurious en-suite bedrooms, as well as an elegantly appointed powder room. Upstairs features three large en-suite bedrooms, and grand, penthouse style master suite that will rival all others. The stunning master suite features a splendid sitting room, romantic fireplace and two oversized walk-in closets, as well as a show-stopping, fully remodeled marble spa-style bath. Every room in this home is grand, featuring spectacular views. Come home to Mountain View Estates!" 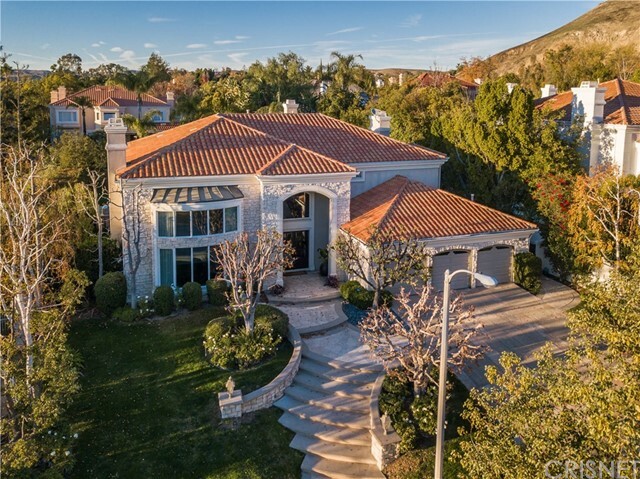 "Stunning custom-built Calabasas estate located in the prestigious Mountain View Estates guard-gated community with sweeping panoramic views and gated courtyard entry. This private 6 bed, 6 bath home is sited on a premier end of cul-de-sac location & features a grand entry with soaring ceilings & sweeping staircase, 4 fireplaces, grand living & formal dining rooms, great room w/wet bar & temperature controlled wine closet. Chef's kitchen features top-of-the-line Viking appliances, 2 dishwashers, full-sized refrigerator/freezer & sunny breakfast area. Master retreat w/warming fireplace & viewing balcony, dual closets and spacious bath. Handcrafted & distressed wood accents, with custom architectural detailing throughout. Designated library, downstairs office and gym. French doors lend access to the lushly landscape grounds complemented by an infinity pool, spa, multiple seating areas, covered patio with outdoor fireplace, fountains & poolside gazebo. Extraordinary unobstructed views."